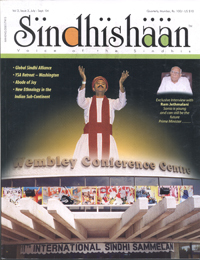 by Sindhishaan in its Issue 2 Volume 3 Apr-Jun 2004.
culture and culture is the life and breath of any community. By nature we are not only tolerant but we respect all religions, and cultures of the world. We have got a god given gift of adjusting to circumstances and try to live cheerfully in all circumstances. The experience of migration from Sindh in 1947 and thereafter is a point on the subject to be studied. To save our Dharma and culture we left Sindh empty handed. We were caught unprepared by the sad event of partition of the country and were forced to leave our dear motherland and also all properties acquired and built there. In India the rehabilitation and settlement work by the Government was very poor. Some voluntary and NGO’s had started transit and relief camps. We had to pass hard and troublesome nights in the camps. Male members of the family went out in search of shelter, employment and business leaving children and women in the camps. Our children sold “Mungphali” and “Murmuras” in trains risking their lives. Even the ladies started working and running tea shops. Some philanthropists did come forward to run free and charitable educational and healthcare centers. We passed all such times smilingly and without any political demonstration. It is said “God helps those who help themselves”. In fact this is our nature and culture which is known as Sindhyat. Unity is required not for selfish ends but for making the nation and the world at large happy, which is the purpose of life itself. The only question is as to how to unite ourselves. Some of us feel that it is not only difficult but impossible to unite Sindhis. It is said that Sindhis are “Juaro Atto” which cannot be united. I do not agree with such pessimistic views. Difference in ideas will always be there; let us try to understand each other. We should have respect and love for each other. The common goal of betterment of the society and humanity is bound to help us in sorting out our differences. Let us rise above selfish interests. Can any one deny that there do exist good and noble people in every community who sacrifice their own interest and serve society. Let us follow them. Gita teaches us “YAD YAD ACHARATI SRESHTHAS TAD TAD DEVE TARO JANAH” which means that one must follow the actions of good people. Shri Arun Babani paints a gloomy picture and appears to be without hope for Sindhi unity due to certain drawbacks of human nature. Let us be clear that our unity should be non political and only social. Dr. Satish Rohra says that Sindhis do not require “Badhee” but “Budhee”. Every man has “Budhee” but he can not live alone. He has to live in society, and society can be ideal only with “Badhee”. It appears to be a difficult job to organize Sindhis on all India level. We must appreciate that there are certain public spirited persons like Shri Raj Daswani of London who is organizing a world conference of Sindhis in London in July this year. The object is to unite Sindhis of the world. We should have confidence in ourselves. In India too there are some all India Organizations of Sindhis; Bhartiya Sindhu Sabha having it head office at Bombay and headed by Shri Jhamatmal Wadhwani; All India Sindhi Samaj having it office at Ajmer and headed by Shri Nanakram Israni of Ajmer, to name a few, that have been working towards this objective systematically over a period of time. Every town in India has got a Sindhi Panchayat and also regional organizations known as Sakkur Panchayat, Jacobabad Panchayat etc. There are number of literary and educational organizations who try to preserve our Sindhi language at an all India level. It requires some organizational skill, perseverance and selfless service without much unnecessary publicity. It requires devotion of time and money both. There is no need to be discouraged or disheartened.